Renthal bar mounts are 1 1/8• diameter and are designed to replace your OE 7/8• diameter bar mounts. This upgrade will allow you to fit a Renthal Fatbar® or Twinwall® to a motorcycle which has 7/8• handlebars fitted as original equipement. . These mounts are meant to be used with the OEM rubber cones. • The clamps are CNC precision machined from 6082 T6 solid billet, high strength aluminium alloy. • Precision CNC machining ensures a perfect fit between the handlebar and clamp for maximum clamping strength. • The bolts are CNC machined from nickel chromium molybdenum 817M40 steel and the hardened and tempered to grade W strength. • A unique bolt head design with part hemispherical seating blended into the shank minimises the chance of bolt failure. 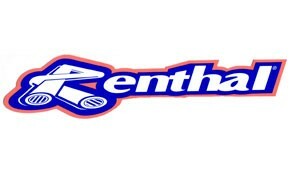 • Renthal bar mounts are designed to replicate the bar postion of the OE bar mounts. • Please note Renthal bar mounts are designed to utilize the OE rubber cones.